Diva, We purchased a house that requires new carpet throughout. We have been looking and have decided to go with Mohawk/DuPont’s SmartStrand since it seems to provide good stain resistance and long life. The two decisions we have left to make are which type. We know we want cut (no Berber). My wife likes frieze, but I worry that it will go out of style (like Shag) and be a hindrance when we try to sell our house down the line. I think a safer play is plush, but my wife thinks that will go out of style. What is your opinion? I guess I’m looking for some carpet buying tips. Also we would like your input into the weight of pad we should get. Most places have 6lb or 8lb, but one place even had 10lb. Is the moisture seal on the pad worth it or will it create “squeaking” problems? We have three young kids (under 4) with one on the way. Your input is appreciated. Thanks. Bryan, there are definitely a lot of options when it comes to purchasing new carpet. The best advice I can give you is to purchase something in a neutral in color, especially with potential home resale in the future. As for style, it’s really anyone’s guess as to which style will still be popular in five years. Since it sounds like you and your wife are thinking different styles, you might want to check out the texture carpet style. If you choose a texture that has slightly longer strands, you’ll be getting the best of both the plush and frieze styles. Texture isn’t as smooth on the top as a plush so it tends to stand up to heavy traffic longer and is not as formal looking. It also isn’t as long as some frieze’s so there is less chance of the fibers laying down and needing to be raked back up like shag. So as long as you stick to a neutral color carpet, style isn’t as important. 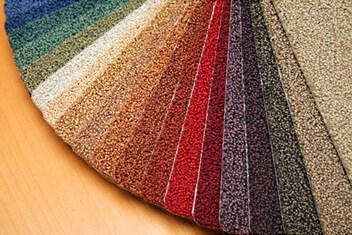 Most home buyers can live with a carpet style they don’t like as long as the color is neutral. Something else worth mentioning – what happens if you don’t move out of your home? Don’t focus completely on what potential buyers would like, instead consider the time you have left in the house and what you want out of a carpet as well. It would be a shame to purchase brand new carpet that you can’t even enjoy! Carpet pad. When it comes to choosing a carpet pad, I’d suggest going with at minimum the 8lb pad. Since you have kids under four years old in the house, you definitely need the pad with the moisture barrier. Personally I haven’t had any trouble with pads that have moisture barriers sounding squeaky, but if you’re concerned about it, look for a pad that the entire material is a moisture barrier. Typically these pads resemble a memory foam and are partially made of soy beans and are eco friendly. They can also be made of rubber or latex. The moisture barrier is important because when you spill liquid on the carpet it soaks into the carpet pad too and then can wick back up into the carpet later on. This is what creates those spots you think you’ve cleaned but just won’t go away. In addition to helping keep the carpet cleaner, a pad with a moisture barrier will also help protect your subfloor, which is especially important if yo have or are planning on getting pets. Pet accidents that are allowed to seep into the subfloor may create an odor you just can’t get rid of. Not to mention ruin your subfloor. No matter what carpet style or color you chose you are making a good decision going with the Mohawk/Dupont SmartStrand carpet and upgrading the carpet pad to something with a moisture barrier. Just remember you can’t please every potential buyer, so make sure you choose something you like as well.